I use Grammarly for proofreading because what's more annoying than stumbling over a sentence full of "omgz" and "lolz"?! I honestly can't even tell you what took me so long to pick up Hex Hall. Despite it taking me forever to finally start this series, I absolutely loved every minute of it. From the sarcastic main character to the incredible world building, I'll never be able to get enough of the amazing story Hawkins created. The book starts with Sophie Mercer trying to help a fellow classmate at prom. Despite Sophie's good intentions, the spell doesn't go as planned. Since this isn't the first time Sophie has misused her magical gift, she's sent off to Hecate Hall (known by the students as Hex Hall) which is located on a remote island. 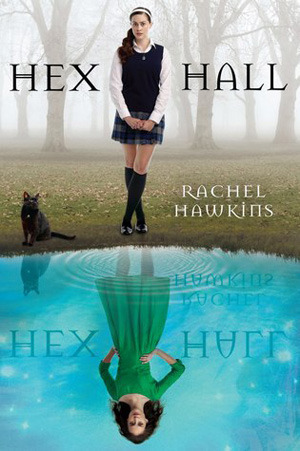 Hex Hall is a boarding school for misbehaving prodigium (witches, warlocks, fairies and weres.) Recently after the new school years starts, students start getting attacked by an unknown monster. I absolutely loved Sophie. She's brave, sarcastic and I just adored her from the start. I love that how almost everything she does, she does with good intentions, even if not everything comes for the best. Sophie never stops searching for who she really is and who is going around hurting her classmates. I totally love her sass and witt. She's definitely an all time favorite leading lady for me. The supporting characters were also a plus for me in this book. They all are so different and offer something unique to the story. They're all not the 'stereotypical' fairy, witch, etc. I loved Jenna, Sophie's best friend, roommate and the only vampire on campus. Jenna is incredibly loyal and has a fierce love for pink! Also, Sophie's crush, Archer Cross, is definitely swoon-worthy and funny too! One of my absolute favorite parts was Rachel Hawkins amazing world building. I seriously feel like I've roamed the haunted halls of Hecate Hall with Sophie and Jenna. Whether Hawkins was describing the surroundings or just different concepts of magic, all of her descriptions were flawless and easy to follow.
" This room looked like it had been decorated by the unholy love child of Barbie and Strawberry Shortcake." I am one-hundred percent in love with the Hex Hall series. I've already started on book three and let me tell you, it just keeps getting better and better with each book! Rachel Hawkins world building is absolutely amazing. I've loved spending time with Sophie and discovering the secrets of Hex Hall with her. Once you start this book, you'll have trouble stopping until you've finished the entire trilogy, it's just that amazing! *This post was sponsored by Grammarly, but all thoughts and opinions expressed are my own.